The classic smocked baby bonnet worn by millions of baby this simple pattern is ideal for your first smocking project. The design for this bonnet uses the two basic smocking stitches, the Wave and the Cable. The bonnet itself requires very little construction and can be finished by machine or by hand. It makes a wonderful baby gift or the first piece of your new babies layette. 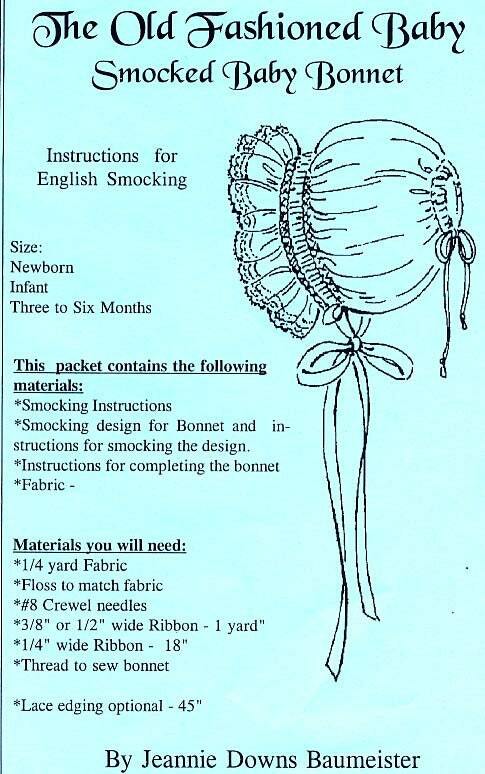 The pattern contains a simple smocking design and instructions on how to smock. The pattern is lovely! Thank you very much. Great pattern, quick service, thanks. Fast shipping - can't wait to try it! Thank you!